Landscapes, ecosystems and biomes are the structures that create a habitat for sounds. Sometimes a sound can find its way across the borders of land and ocean, forging a musical connection between different terrains. 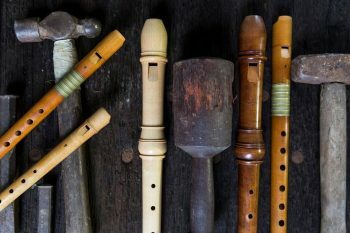 The tones produced by duct flutes or fipple flutes, like the recorder, can be found across many cultures throughout the world and this ancient dissemination of a particular sonority resonates with many people. In this new collaboration, Rodney Waterman and Ryan Williams explore the subtle intricacies of the various duct flutes in their search for a quintessentially Australian end blown flute sound. Hear a reimagined world of music, from a mix of original art music, real-time compositions and historically informed performance for two recorders with a hint of electronic sounds. Rodney & Ryan create music that has been heavily influenced by the emerging contemporary folk flute music idioms from Finland and Sweden, set alongside music by French Baroque composers, all responding to the Australian landscape that encompasses the performers lives.